Disasters come in many flavors, although most people think of them in terms of epic storms with names like Katrina or Hugo. But your business can also face threats from security breaches and data center outages caused by less dramatic events, such as broken water pipes, electrical fires or simple human error. It’s easy to assume your information is not at risk based on its geographic location. But if you stop to consider the value of your data, it becomes clear that you cannot afford to be complacent when it comes to disaster recovery. In this series, we’ll give you an overview of best practices, tips and suggestions on how to ensure your organization’s information is safe and easily accessed in the event of a disaster, natural or manmade. And when you break it down into more detailed categories, the outlook is not much better. Do you have a comprehensive strategy in place to cover all the aspects of disaster recovery? Specifically, you need to understand how data is handled and recovered as part of your plan—because if you lose your data, you’ve lost customer and application data – and possibly your reputation. Many IT professionals have embraced the philosophy of noninterference when a legacy system is working fine. Don’t make this mistake. To adequately safeguard all your data, whether it’s on the cloud or in legacy applications, and then restore it quickly following an outage, you need a software-defined storage solution (SDS). This approach gives you the ability to manage your data storage resources and functionality with no dependencies on the underlying physical storage hardware. 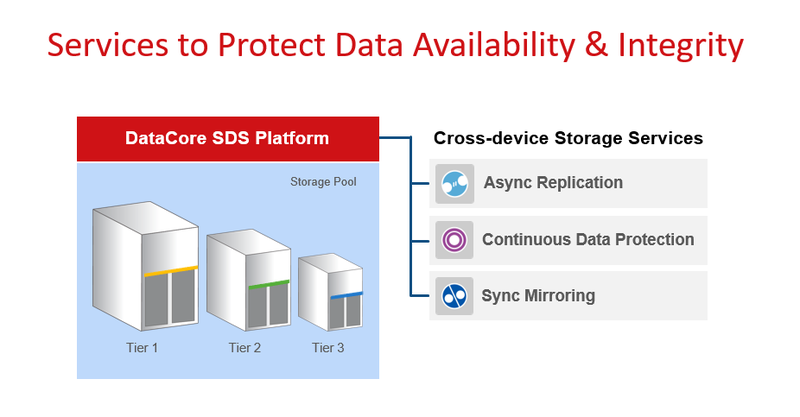 DataCore’s SDS platform has built-in storage services that protect data availability and integrity, including asynchronous replication, continuous data protection, and synchronous mirroring as shown below. In the next post in this series, we’ll do a deeper dive into how DataCore’s technology supports your overall disaster recovery strategy.